I have an upcoming solo exhibition at the Mission gallery in chicago in the project space known as the Sub-Mission. 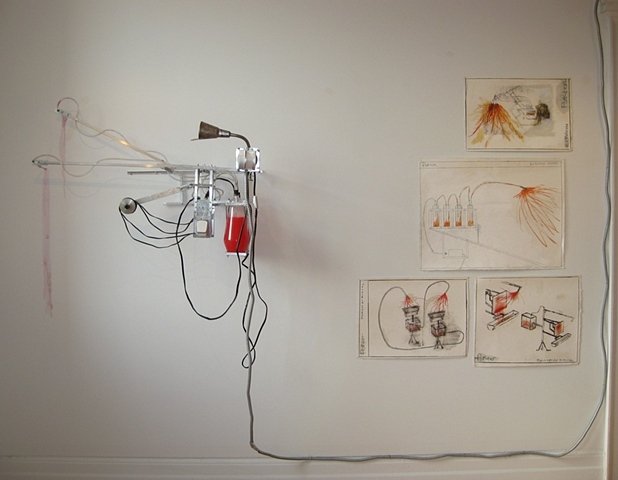 The exhibit will be titled Autohemorrhaging Actuator and will run from November 9-December 22, 2012. This exhibit will be my site-specific sculpture. Fusing found objects and his own custom-made creations, Mark Porter produces one-of-a-kind pieces that gradually transform themselves — and the gallery — as the show progresses. The mechanical-drawings-turned-sculptures in Nurture/Alter mimic the irregularity of human actions and portray narratives through a series of projected images, videos, and fluid expulsions. Porter places his project blueprints next to the sculptures to aid in the understanding of their development, which continues free of his influence for the duration of the exhibition. Check out the show sooner than later, though, so you can observe the counterproductive movements of Porter's work before it slowly self-destructs.